Kennedy's five-inning win concludes a dominating run through the playoffs that featured three shutouts. Two years ago the Pilot Rock Rockets eliminated the Kennedy softball team from the playoffs by 10-run rule in the state semifinals. It seemed only fitting that the Trojans returned the favor. 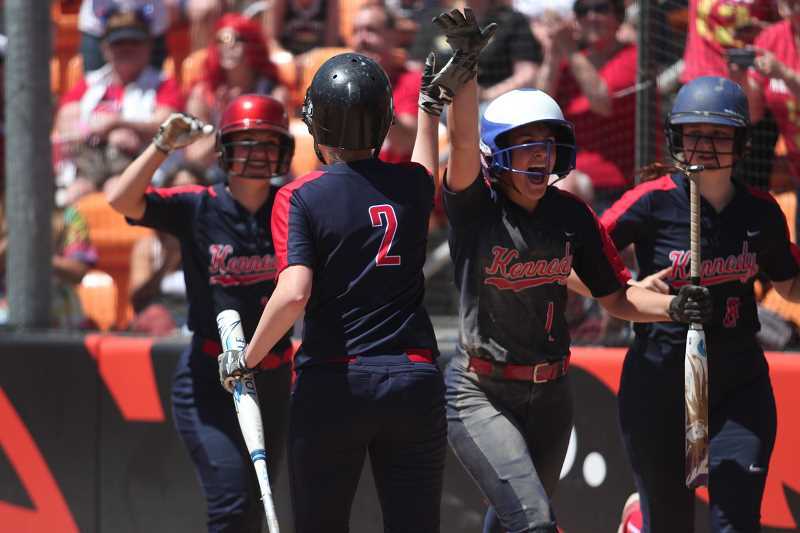 The Kennedy Trojans defeated the Pilot Rock/Nixyaawii Rockets 10-0 in five innings at the Oregon State University Softball Complex on Friday to win the 2018 2A/1A State Softball Championship. 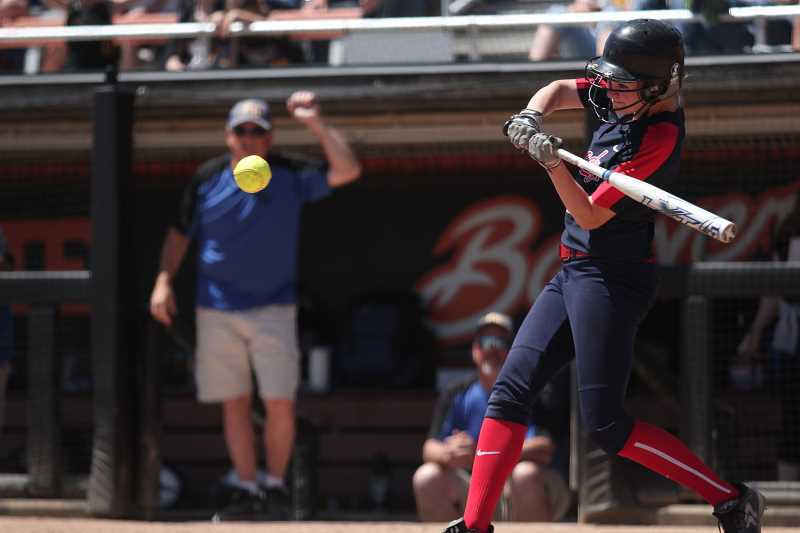 The victory completed a whirlwind two-week playoff period for Kennedy (24-4, 17-1 Special District 2), which decimated its competition to bring its first state softball championship home to Mount Angel. The win over Pilot Rock (23-4, 10-2 Special District 6) was the final game of a post season run in which the Trojans recorded three shutouts, won three of four games by 10-run rule, and outscored opponents by a 46-1 margin. 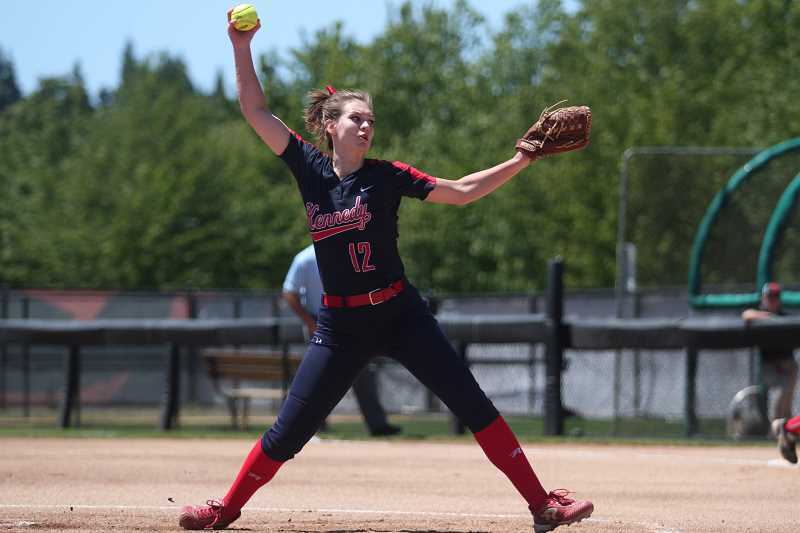 While the Rockets were making their fourth consecutive trip to Corvallis for the 2A/1A State Championship game, this was only Kennedy's second finals appearance in program history. "We knew it would be tough because they've been here before," Kennedy senior Molly Jaeger said. "They know what the nerves are like." Pilot Rock's championship pedigree — winning titles in 2010, 2015 and 2016 — helped give the Trojans an underdog mentality going into the contest despite carrying a 14-game win streak behind them. "I don't think we were expected to win," Kennedy senior Tressa Riedman said. "Pilot Rock has been here the past four years. Our goal was to get to the championship game, and anything extra we were just happy to do. "They're a great team, but I think we just had our best game of the season." Riedman admittedly can get anxious for big games before settling down into a rhythm after an inning or two, but the Trojans' three-time Conference Pitcher of the Year immediately fell in sync from the opening pitch. After inducing a ground out to start the contest, Riedman struck out the next two batters and went on to rack up 11 strikeouts while allowing just one hit and one walk to the Rockets. "Me and her usually have nerves before a game," Trojans senior catcher Abby Frey said. "Today we were just so pumped for the game. I think that helped us to come out with a punch." Despite getting a runner to third base in the opening inning, Kennedy didn't strike until the second when junior Kalyssa Kleinschmit's sacrifice fly brought in freshman teammate Ellie Cantu. The Trojans plated two more — Kelsey Kleinschmit and Emily Cuff — on a play in which the Rockets botched an attempt to throw out Riedman at first, one of two errors in the inning for Pilot Rock. Kennedy added another in the bottom of the third on a sacrifice fly by Cuff that brought in Jaeger, making it 4-0. After three more strikeouts from Riedman in the top of the fourth, the Trojans added four more in the bottom of the frame, three of which came on a bases-loaded double from freshman Hailey Arritola. She in turn scored on a double from senior Hannah Arritola to double Kennedy's lead, bringing the Trojan dugout to a party-like intensity. "I didn't really realize how big of a lead we had until someone was like, 'We're ahead 8-0,'" Frey said. "That's when it hit me, and I was like 'Holy cow, this is a huge lead.'" The Rockets were able to get their only hit off Riedman in the top of the fifth, but couldn't make any headway against the Trojan defense, which closed out the inning on a diving catch from freshman right fielder Elise Suing. Pilot Rock changed out starter Ayana Aguilar for Kayla Deist in the bottom of the fifth, but it wasn't enough to slow down the Trojans. Kalyssa Kleinschmit singled and Frey walked to open the inning. After bringing in Kelsey Kleinschmit to run for Frey, Riedman hit an RBI-doub to bring in Kalyssa Kleinschmit and make it 9-0. Sophia Carley came in for Riedman, and the Rockets intentionally walked Hailey Arritola to load the bases for Jaeger. The senior took a high pitch up the right field line for a single that scored Kelsey Kleinschmit for the game-winning run. "That felt amazing," Jaeger said. "I loved it, but I knew that no matter who it was, they would have done it." Hailey Arritola led the team on offense, going 2-for-2 with two walks, three RBIs and a run scored. Hannah Arritola and Jaeger also added a pair of hits, and every member of the Trojans who saw a plate appearance either tallied a hit or a walk in the victory. Riedman's near-perfect game on the mound earned her Player of the Game honors. "She was pretty focused," Kennedy head coach Walt Simmons said. "I didn't think today would happen this way, but they just hit the ball really well, and Tressa was on. That combination — it really came together." The victory concluded the best athletic year in school history for the Kennedy girls. In the fall, the Trojan volleyball team had its highest finish in program history by placing third in the state tournament. That led to the winter season in which the girls basketball team brought home its second state championship trophy in the past three seasons. 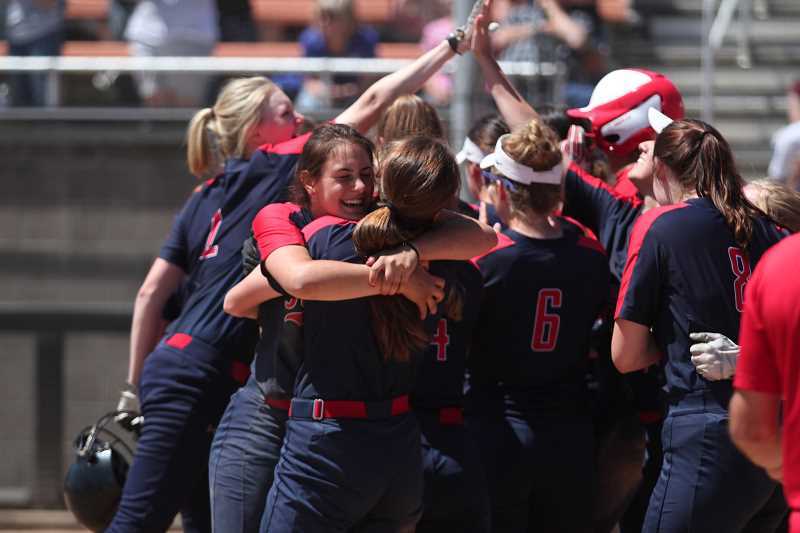 Then this spring, the girls track and field team placed fourth at the state championships, just before the softball team's state title playoff run. "I was ready," said Riedman, who watched from the sideline as many of her softball teammates celebrated the basketball championship in March. "It was my turn, it was our turn, softball needed something too." The win also gave a measure of closure to the 15-year coaching duo of Simmons and longtime assistant Steve Buchheit. The pair guided the Trojans to the program's only other state softball finals appearance, losing 3-2 to the Waldport Irish in 2006. "Being here the first time, it was like, 'Well, we made it,'" Simmons said. "Coming here this time, it's like 'We need to finish it.' It's just a great feeling."